santec » SANTEC offers High-Power LCOS spatial light modulator “SLM-300”. Home > News > Press Releases > SANTEC offers High-Power LCOS spatial light modulator “SLM-300”. ・ SANTEC, a leading design and manufacturer of tunable lasers, optical instruments, OCT products, and fiber-optic components, has introduced a high-power durable LCOS spatial light modulator (SLM) (product code: SLM-300) with enhanced Liquid Crystal on Silicon (LCOS). ・ The SLM-300 has been tested to withstand up to 200 Watts of power, making it the world’s most durable SLM. When compared with santec’s conventional SLM-200, the SLM-300 displays over 100 times higher power durability, making it an ideal choice for high-power laser processing, 3D-Printing and IC trimming applications. 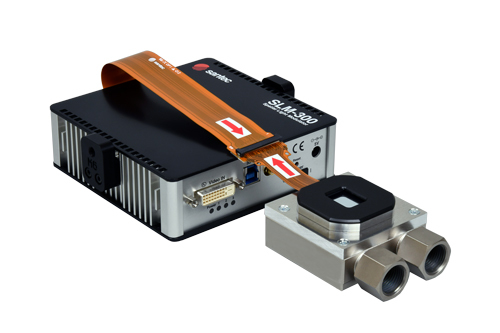 ・ The SLM-300 will be showcased at the BiOS / Photonics West 2019 in San Francisco , February 2 to 7, 2019, at SANTEC’s booths #8762 / #762.